Our largest project in company history. Apple Parmer Lane Campus covering 6 buildings. Using with the most sophisticated Somfy motors and Shades by SWFContract. Somfy Animeo IP building controllers and Sun Sensors control the shades on all four elevations of each building. Designed as a training room for Keller Williams Realty International, this project consists of SWFContract Solar shades with Somfy RTS 120 v motorized shades. Shades are coupled together to reduce motors and the fabric is SheerWeave 4100 Color Ash. Southwestern University has been a long standing customer of ours and we were privileged to be part of the renovation of the Cullen Administrative building. 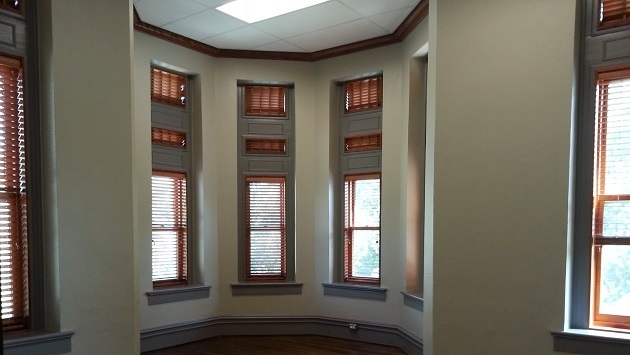 All new Graber Traditions 2" Wood Blinds installed on all functional windows and Fixed Stationary Arch and Square Top Blinds installed in the Arch and Square Upper portions of the building.